West Yorkshire is a metropolitan county within the Yorkshire and the Humber region of England and came into existence as a metropolitan county in 1974 after the passage of the Local Government Act 1972. The county is landlocked and consists of five boroughs the City of Bradford, Calderdale, Kirklees, City of Leeds and City of Wakefield and shares borders with the counties of Derbyshire to the south, Greater Manchester to the south-west, Lancashire to the north-west, South Yorkshire to the south-east and North Yorkshire to the north and east. West Yorkshire has the most built up and biggest urban area within the historic county boundaries of Yorkshire and lies almost entirely on rocks of carboniferous age which form the southern Pennine fringes in the west and the Yorkshire coalfield further eastwards. In the very east of the county there are younger deposits of magnesian limestone. The Bradford and Calderdale areas are dominated by the eastern slopes of the Pennines producing many steep-sided valleys with a network of roads, canals and railways. This large industrial and urban area creates views of a wonderful mixture of open countryside, settlements and demanding hills. The Yorkshire coalfield is a rolling landscape of hills, escarpments and broad valleys with many converted or derelict mine buildings and recently landscaped former spoil heaps. The magnesian limestone belt to the east of Leeds and Wakefield is an elevated ridge with smooth rolling scenery and dry valleys dotted with many country houses and estates with parkland, estate woodlands, plantations and game coverts. The River Aire and the River Calder drain the area, flowing from west to east. The River Aire is a major river flowing for 71 miles rising at Malham Tarn and after passing through West Yorkshire it enters the River Ouse at Airmyn in the East Riding of Yorkshire. Part of the river is canalised and is known as the Aire and Calder Navigation. The River Calder a tributary of the River Aire rises on the slopes of the Pennines at Heald Moor near Todmorden in Calderdale and flows for 45 miles before entering the River Aire at Castleford the confluence of the Aire and Calder. The Peak District is made up of two areas The White Peak which is a limestone plateau of green fields with rolling hills and many dales and The Dark Peak (or High Peak) which is a series of higher, wilder and boggier grit stone moorlands. The Peak District is also known as the Derbyshire Peak District and also covers areas of Greater Manchester, Staffordshire, Cheshire, West Yorkshire and South Yorkshire. Although there are no prominent boundaries the central and most rural area of the Peaks lie within the Peak District National Park. The National Park covers 555 square miles of Derbyshire, Cheshire, Greater Manchester and South and West Yorkshire and 12% of the park is owned by the National Trust a charity which aims to conserve historic and natural landscapes and does not receive government funding. The Peak District National Park Authority provides public facilities such as car parks, public toilets, visitor centres and also maintains the rural nature of the park although most of the land is still owned by the traditional landlords. Holmefirth is a small town, centred round the confluence of the Holme and Ribble rivers, in the heart of the Holme Valley and best known as the location for the popular BBC comedy and sitcom “Last of the Summer Wine”. Situated in the Metropolitan Borough of Kirklees north of the Peak District but in West Yorkshire Holmfirth originally grew up around a corn mill and bridge in the 13th century and in the 16th century the town expanded rapidly as the growing cloth trade grew and the production of stone and slates from the surrounding quarries increased. The Holy Trinity church in the towns centre was built in 1778 after the original church built in 1476 was swept away in a flood the previous year. In 1850 Holmfirth railway station opened on the branch line built by the Lancashire and Yorkshire Railway Company and closed in late 1959. Holmfirth was the home of Bamforth & Co Ltd, who were well known for their cheeky seaside postcards and their printing works on Station Road has now been converted into residential flats. The Bamforth’s were also early pioneers of film making before abandoning the business in favour of postcards. The former Lodge’s supermarket, built over the river in the 1970’s and opened by Radio 1 DJ Tony Balckburn, was bought by the Co-op in the 1990’s. The Co-op closed in 1997 and moved to its present building. After being empty for some time the Lodge’s building went under extensive modernisation into smaller shops and accommodation on the top floor. 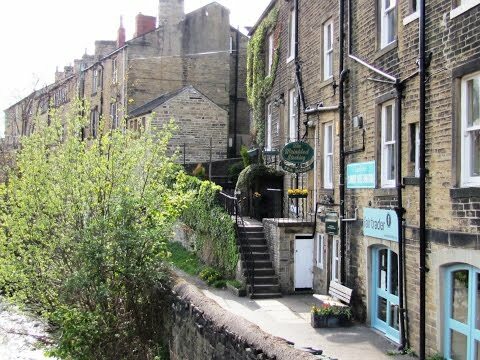 Today Holmfirth attracts thousands of visitors and fans of the television series “Last of the Summer Wine” every year to visit Sid’s Cafe, Nora Batty’s home and Steps, the Wrinkled Stocking Tea Room and the Summer Wine Exhibition. It is the longest running comedy programme in Britain and the longest running sitcom in the world. The cast has changed many times over the years with the original trio being Bill Owen as scruffy Compo, Peter Sallis as deep thinking Cleg and Michael Bates as snobbish Blamire and they always got themselves involved in daredevil stunts and boyish pranks. The late Bill Owen was heavily involved in the creation and design of The Summer Wine Exhibition and was keen to provide an interesting and memorable feature for visitors and was officially opened by Compo on Easter Saturday 1996 the 25th anniversary of the programme. The Wrinkled Stocking Tea Room named after the famous stockings worn by Nora Batty who is also a star of the series “Last of the Summer Wine” and appropriately named for it is situated next door to the TV homes of Nora and previously Compo. The CragRats Theatre and Cafe Bar and the Picturedrome Cinema are also popular and there are a wide range of shops, restaurants, wine bars, pubs and a variety of take-aways to suit all pallets. There is a vintage market on Wednesdays, a general market on Thursdays, craft and food market on Saturdays, a farmers market every third Sunday and various special markets throughout the year. Holmfirth with its wonderful scenery across the Holme Valley is also popular with walkers and wildlife enthusiasts. Watch out for the wildlife beside the river you never know what you may see. There are many walks and cycle routes so why not head out for the hills, with your camera, where you will find peace, fresh air and panoramic views all year round. The most popular walks are Digley Reservoir, Blackmoorfoot Reservoir, Ramsden Reservoir, Holme Valley Riverside Way, Holme Valley Circular Walk, Holme Moss View Point and Holmbridge and Holme Walk. Netherthong is a small village situated on the B6107 road to Meltham and houses the All Saints’ Church, built between 1829 and 1830 and remodelled in 1877, two pubs The Clothiers Arms and The Cricketers Arms, a post office and a small village shop / newsagents. The former Wesleyan chapel the first in the Huddersfield area is now a private dwelling. Castle Hill overlooking Huddersfield and the Holme Valley is a Scheduled Ancient Monument and is regarded as one of Yorkshire’s most important early Iron Age hill forts. The imposing structure of the Victoria Tower on its summit was built to celebrate the 60th anniversary of Queen Victoria’s reign, and was completed in 1899. They are only open to the public on certain days. We park in Bridge Lane car park and walk through the Co-op car park opposite and then over the bridge, through the memorial garden with the river on our right. We then walk through the square and car park, passing the public toilets, to the church to visit Sid’s Cafe which is on the left next to the church. We then go over the zebra crossing and bear left then right up Hollowgate to the bridge to view Nora Batty’s Steps and The Wrinkled Stocking Tea Room. We then retrace our steps back down Hollowgate to the square and turn left up Victoria Street to the Tourist Information Centre. We turn left then right into a car park and follow the paved path to the right uphill and up the steps to the top of Victoria Park. At the top we walk through the narrow alley way between the buildings then bear left on the road and turn right onto Halt Lane. At the t-junction turn right still on Halt Lane and keep heading forwards, the lane becomes a track called Mark Bottoms Lane. Follow the track which narrows into a path and when the path splits with a stream on our right we take the right path crossing over a stream. We turn right and follow the path onto a track between to walls going slightly uphill. At the end of the track there is a bench and we turn right and head forwards onto Broomy Lea Lane which leads to Netherthong. At the road we turn right then left opposite the church down Outlane. We then turn left at Church House onto Giles Street and follow the road round and take a sharp right onto Dean Brook Road. We turn left at the school sign and head down to cross a bridge and up some steep steps, at the top we turn right and head forwards onto a wide track. We turn left in front of the Cricketers Arms to pass New Laithe Farm then go through a gate and head uphill to the right of a windmill. We follow the path as it bends right into an open field and using the stone stiles head across three fields towards Victoria Tower on Castle Hill in the distance then through a gap stile to cross a narrow road going through another gap stile into a field and bear right down a narrow path between a wooden fence and a wall to the road. Turn right onto the road and take the second footpath on the left just past a bungalow called Ivy Cottage. Cross the field diagonally to cross a stile and continue to the right of the wall, go over a stile and over another field and keep to the left of the wall to Long Lane. Turn right along Long Lane and left at the top onto Oldfield Road. At the cross roads turn right onto Upper Hag Road and follow the road round the bends, using the footpath on the right, and turn left at the footpath sign just before the first building into Hagg Wood. We walk through the wood then cross straight over the main road taking the track sign posted Holme Valley Camping and Caravan Park. We follow the track to the campsite and turn right onto a track cross the bridge over the river and turn right down the road to a converted mill. At the end of the mill take the footpath on the right, go up some steps and head forwards with a tall wall of a building on the left. We keep to the wall into the wood then at the junction of paths near a wooden gate on the left we turn right downhill over a wooden bridge towards the river. At the end of the wood we go through a gap stile and head forwards past the cricket field on our right then through the field and turn left up a lane. Turn right at the road then left up Berry Bank Lane and keep to the main track. When the track splits at some new houses we bear left and head forwards onto a small tarmac road. Head forwards for a short way and then right towards Holmfirth along New Mill Road and Station Road. Just past the Kingdom Hall of Jehovah’s Witnesses on the right and opposite house No 60 on the left turn right down a path then cross the road to go down some steps to cross the River Holme. We now follow the river on our left towards Holmfirth centre and return back to our car through the Co-op car park. This is a moderate walk on public footpaths and tracks through fields and woods. There are steep steps, some moderate inclines and declines and sections of road without pavement. Approx 5.5 miles allow 2 hours 15 minutes using OS Explorer Map 288, Bradford and Huddersfield. Start Point: Holmfirth Tourist Information Centre. Holmfirth situated in the Holme Valley in West Yorkshire. From the M1 coming from the north take junction 39 and take the A636 to Denby Dale then turn right onto the A635 and follow the A635 into Holmfirth. From the M1 coming from the south take junction 37 and follow the A628 at the second roundabout turn right for Huddersfield then turn left onto the A635 and follow the A635 into Holmfirth. There are three pay and display car parks, some parking spaces in the square and some free road side parking. We park in Bridge Lane Long Stay car park £2.80 all day. The other car parks are £2.80 all day except the Co-op which is £4 all day. There are public toilets in the square in the centre of Holmfirth and for refreshments there are ample shops, tearooms, cafes, restaurants, wine bars and numerous pubs. There are also two pubs in Netherthong, The Clothiers Arms and The Cricketers Arms.